At Trees Organic, we roast our own organic fair-trade coffee beans. How do we do it? Café owner Doron Levy roasts beans right in the café on Granville Street several times a week. He shows how it’s done. 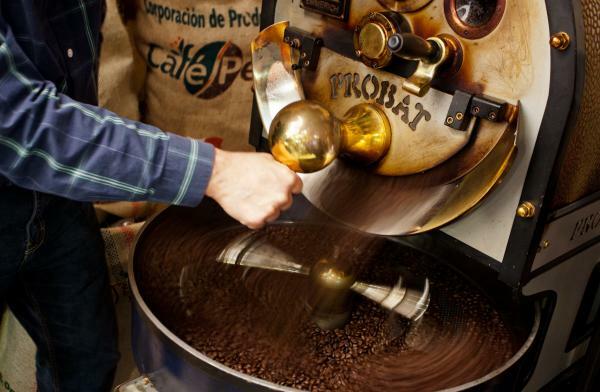 Trees Organic uses a commercial-quality Probat coffee roaster to ensure that the best beans get the treatment they deserve. After all, we work hard to source organic coffee beans from around the world that meet our customer’s standards. First, Doron puts fresh beans into the top of the roaster in a part called the hopper. He sets the temperature he wants and when the thermometer gage says it’s ready, he drops the beans in by turning a lever. Once the coffee beans are in the roaster drum, baffles turn the beans so that the roasting will happen evenly. This is important to ensure a uniform taste for the batch. Think of it the same way as clothes tumble in a dryer. Doron can see the beans through the sight glass, but it’s a bit tough to really get a sense of what’s going on inside the roaster. To get a better feel for the process inside, he can pull out the tryer, which holds a few of the roasting beans. He can look at the beans, smell them and decide when the beans are perfectly roasted. Timing is really important, as even just a few seconds either way can mean the difference between too light or too dark of a roast. When the coffee beans are ready, Doron opens the little door at the bottom and drops them into the cooling tray. He moves the stir arms to keep the beans moving and ventilated so they cool quicker, sealing in the smell and flavor of the coffee oils. Fast cooling ensures the beans do not continue roasting from the residual heat. Then the beans are collected and when the time comes, they are ground and served to our coffee-loving customers. Have you tried our holiday-featured Ethiopian Sidamo Coffee? We love this coffee bean. It delivers an earthy aroma with just a hint of chocolate – a very pleasant coffee for the consummate café aficionado. Ask for it when you come in – and yes, the Granville café is open on Christmas day from 11 am to 5 pm. Drop by and say hello! All fans of our coffeehouses and lovers of our award-winning cheesecake are invited to an anniversary party at Trees Organic cafes in Gastown (Vancouver) and Richmond. Our Gastown location is having its second anniversary and our Richmond café is turning lucky seven! This Thursday, December 15, enjoy some holiday party atmosphere as our cafés will be serving up FREE slices of our classic New York cheesecake and holiday-featured Chocolate Orange cheesecake all day long. Yes, you read that right: Free Trees Organic cheesecake. All. Day. Long. Grab a slice and enjoy. But remember, the parties are only happening at our Gastown and Richmond locations. Wait… Sorry? You love Trees cheesecake and coffee, but you haven’t visited our other café locations yet? Well, come on down. Don’t be shy. It’s a party. Invite your friends to the party! Hey, we’re friendly. The more the merrier. Tweet, Facebook, email and call your friends down to enjoy some cheesecake, coffee, treats and good times at Trees Organic cafes. This year we wanted to get you something special for Christmas. We’re excited, because we got our hands on some beautiful Sidamo coffee beans from Ethiopia, where coffee was first discovered by a 9th-century Ethiopian goat herder. The beans came in on Tuesday and we roasted our first five-kilo batch on Wednesday in our Granville Street Roasting House Thursday we had our first coffee cupping. We fell in love. It has medium body with some subtle brightness and chocolaty tones. It’s got great balance and nice length. Our Ethiopian Sidamo beans create a cup that is hard to put down. Coffee is like wine, origin matters. These beans are from Sidamo in Southwest Ethiopia. Of the Arabica varietal. How did we roast the Ethiopian Sidamo coffee beans? This batch was roasted medium dark to make sure we don’t cover up some of the beautiful fruity notes or the chocolaty notes. The beauty of small batch roasting is that we can make a slightly different roast in our next batch a few days later. Variety is the spice of live. Roasting is an art. Why are we highlighting Ethiopia Sidamo beans for the holidays? Christmas is a time of giving and Ethiopia sure needs some help. It is one of the poorest countries in the world. When we buy fair trade organic coffee from Ethiopia, we support local growers and their families. Sidamo was a province in the southern part of Ethiopia. It was named after an ethnic group native to Ethiopia, called Sidama, who are located in the south-central part of that country. Their major political state was the ancient Kingdom of Kaffa. How can I try some of the Sidamo coffee? We’re selling the beans in our Granville, Richmond, Gastown and Yaletown stores. (This is a premium bean so it is a bit more expensive). One little secret. Load the Clip Mobile App on your phone and enjoy a great coupon deal. Our gift to you. You may also see the Sidamo as one of the two coffees of the day. Keep and eye on it and give it a try.